Abstract: Does that old 250W not cut it anymore? Runing a few peltiers on that Athlon? Looking for something with a little more juice.... have a look this 350W monster with M/B fan speed monitor from Enermax. Does that old 250W not cut it anymore? Running a few peltiers on that Athlon or CuMine? Looking for something with a little more juice.... then have a look this 350W monster with motherboard fanspeed monitor from Enermax. Meets Intel 2.01 & 2.03 Ver. The EG351P-V we have was put into a mini-server case, an essentially bar fridge sized contraption. The areas which house the motherboard and cards is separated by a wall from the hard drive and another components like the CD-ROM. 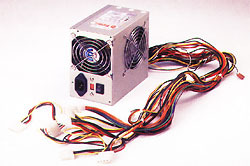 The powersupply is located in this region, so the wires have to travel a ways to get to the mother board, and any case fans. Enter in the long ATX power connector - about 30", and the three sets of HDD connectors which stretch about 1 meter. Long wires a definite must for a server case, and an added luxury for a full tower. 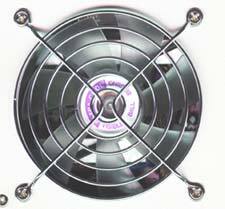 The only problem we saw with the powersupply had to do with the fan monitoring cable. It worked well enough, but the fan speed was lower because of the sheer size of the fan, and the particular monitoring software we used (AOpen) assumed it was a bad fan, rather then a case fan. Its a great feature to have, so long as the software behind it is good.